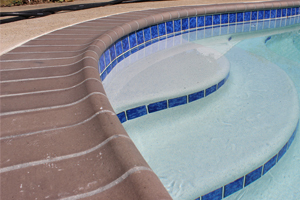 Swimming Pool Tile & Coping | Coronado's Pool Plaster, Inc. There are many options when picking tile and coping. Coronado’s Pool Renovations can customize your coping with a more modern look or a more traditional or organic look. Materials to go around the edge of the pool for the coping are; brick, slate, travertine, limestone and flagstones. Most of these coping materials will vary in shades, thicknesses and weight.. Swimming Pool tiling can give your pool a nice finishing touch. Enhance your hardscaping efforts. Go with a more soft earth tone or go all out and get a bright stunning color. Tiling can help protect the edge of your pool and is a great finish to a plaster job or coping job.